Leading Manufacturer of ishake 020 soot red bottle, ishake 020 smart one blue body shaker bottle and ishake 020 smart 1 orange from New Delhi. “Stay Fit is not a destination, it is a way of life”. Keeping your fitness goals in mind, iShake presents its Smart One Shaker Bottle – 500 ml. It is made from high quality food grade, non-toxic and 100% BPA Free for health safety. It’s easy to fill and easy to clean, giving you long years of use. 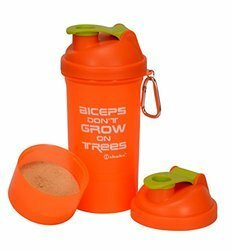 It contains one storage box for protein supplement and one Power Mixer/Strainer for eliminating powdered lumps. It is beautifully designed for easy drinking and pouring. It comes with a key chain for easy carry. It is available in variant color combinations of body, cap, lid and strainer. 1. Snap on Power Mixer and Storage Box: Experience the scientifically designed Power Mixer/Strainer which helps you eliminating powdered lumps completely and carry your protein supplement along with your shaker. Smart One has got one detachable storage box. Owing to the presence of skilled team, we are involved in providing a broad collection of iShake 020 Smart One Blue Body Shaker Bottle. We are devotedly engaged in offering wide assortment of iShake 020 Orange Bottle.